Good news for the citizen of Haryana, on 26th Feb 2019 Haryana government launched Haryana Mukhyamantri Parivar Samman Nidhi Yojana. Under this government scheme, farmers and unorganized sector worker will be benefited. HMPSNY 2019 will give financial and social benefit. 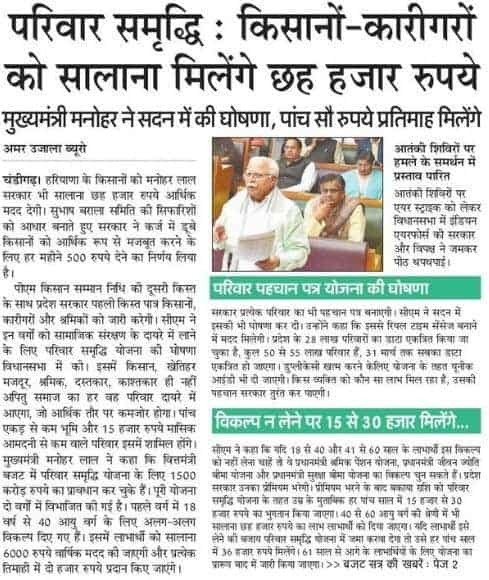 Main eligibility for Haryana Mukhyamantri Nidhi Yojana is that farmer land should be upto 5 acres and unorganized worker salary should be less than Rs 15,000. Chief Minister of Haryana, Manohar Lal Khattar announced Govt. scheme. Get to know Parivar Samman Nidhi registration, how to apply procedure, Yojana beneficiary list, benefits, eligibility criteria. 1.2 How to Apply Haryana MPSNY? Under the scheme the government will distribute Rs 6000 per year to the beneficiary family. Haryana Mukhyamantri Parivar Nidhi scheme is divided into 2 categories. Option 3 On age of 60 year, beneficiary will get pension between Rs 3,000 and Rs 15,000 on a monthly basis. Option 4 Family elected member will be get Rs. 15,000 to Rs. 30,000 after 5 years. Beneficiary can choose option of insurance cover in which state government will pay the premium. Insurance – This scheme also include insurance of Rs 2 lakh on the death, accidental death, permanent disability. Whereas only one lakh will be disburse on partial disability to the insurer. Financial benefit – Beneficiary is included in PM shram yogi maandhan pension yojana, they will also get Rs 3000 on attending age of 60 years. Rs. 1500 crore is already been allocated in the state for this scheme working and distribution. How to Apply Haryana MPSNY? There is no update until date on how to apply for this scheme. Citizen have to wait for any new notification update from the Haryana state government regarding this scheme. Only after distribution of parivar pehchan patra card and ID number one will be able to apply for scheme as per news. However, there will be a formation of separate committee to decide Guidelines, other parameters Mukhyamantri Parivar Nidhi Scheme. We are keeping tight eye on this and will notify any update on regarding online registration and applying procedure. Citizen should have Bhu naksha/Land papers. Haryana State govt. as notified that they are preparing for the 54 lakh families database. After the database is centralized in system, government will issue the 14 digit ID number in the form of Haryana parivar pehchan patra to the eligibile citizens. This card will be used to apply for state welfare scheme like Mukhyamantri Parivar Samman Nidhi Yojana. When “Haryana Mukhyamantri Parivar Samman Nidhi Yojana 2019” come .Approximately in which month.